On Friday, October 26, in a ceremony in Greenville, the North Carolina Literary and Historical Association honored their 2018 award recipients. The North Carolina Literary and Historical Association, established in 1900, is among the oldest organizations of its kind in the nation. For more than a century, they’ve worked to tirelessly to promote the Office of Archives and History and its work, and continue that legacy today by helping to support the diverse programs of the N.C. Department of Natural and Cultural Resources. Their annual competitions aim to promtoe interest in North Carolina literature. Heather Ross Miller, Women Disturbing the Peace. Hammond, LA: Louisiana Literature Press, 2018. Carole Boston Weatherford, Schomburg: The Man Who Built a Library. Somerville, MA: Candlewick Press, 2018. Jerry Gershenhorn, Louis Austin and the Carolina Times. Chapel Hill: University of North Carolina Press, 2018. Wiley Cash, The Last Ballad. New York: William Morrow, 2017. 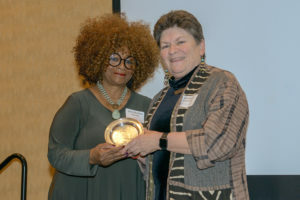 Current North Carolina Poet Laureate Jaki Shelton Green received the R. Hunt Parker Award for significant contributions to the literary life of North Carolina. 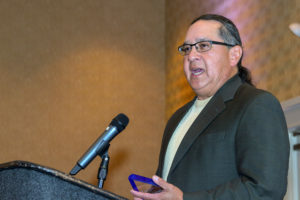 Cherokee dramatist Eddie Swimmer received the Hardee Rives Award for significant contribution and service to the Dramatic Arts in North Carolina. For more information, visit https://www.ncdcr.gov/about/history/lit-and-hist. This was written by charles. Posted on Wednesday, November 14, 2018, at 8:12 am. Filed under Uncategorized. Tagged Carole Boston Weatherford, eddie swimmer, Heather Ross Miller, history, Jaki Shelton Green, jerry gershenhorn, literature, nc department of natural and cultural resources, Wiley Cash. Bookmark the permalink. Follow comments here with the RSS feed. Both comments and trackbacks are currently closed.